It might be Baltic out there but it's always toasty in here. Warm up with a coffee, chill out with a beer, nibble on some tasty bar snacks and enjoy the eclectic soundtrack of Belfast's first ski-themed bar. Have you got Google Earth on your computer? If so, then download the Google Earth view of Baltic. 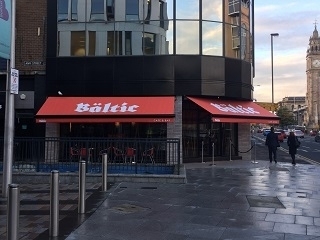 Is this the wrong position for Baltic? If you think so, then modify its position. Click / Tap the button above to get directions from where you are to Baltic.